If you're marketing financial services, you want to work with a writer/marketer who has the capability of understanding your products and conveying your brand image; someone who can write on-strategy, on-message, and get results. I can accomplish all that for you. I have 10 years of success in online marketing. 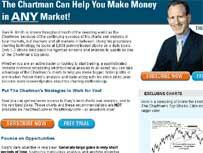 You'll find 70 articles written by me at horsesmouth.com, the #1 business-builiding portal for advisors. I was one of the chief writers on the launch of iShares. In addition to helping companies market online, I have built my own successful web businesses (e.g., buy-condohotel.com;InvestingIN.com). understand your products/voice/message and boost your results? Plus: Upcoming update on my FREE Report "Pay Per Click Success for Financial Advisors"
I created many campaigns as chief creative marketing consultant for The Street.com, headed by Jim Cramer. You may have seen Cramer's TV show Mad Money on CNBC). Let me take you inside some of the successful campaigns I created. These case studies will show the step-by-step process of creation, the rationale and the creative work that was used. See screen shots of an online tutorial, flash ads, emails, landing pages and more. One of the reasons Ameriprise is growing so fast is its focus on baby boomers. 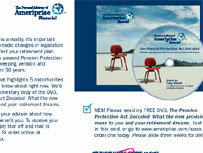 Ameriprise created a DVD informing boomers about key changes contained in the Pension Protection Act. I was part of the team chosen to launch iShares by Barclays Global Investors. 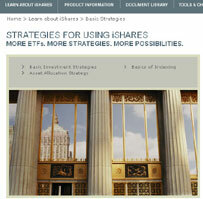 As one of the lead writers and strategists, I wrote many sections of the iShares website. The website had two main tracks: One to individuals, the other to financial intermediaries, such as stockbrokers and financial advisors. The task was to clearly educate these audiences about a whole new investing tool. The other part of the task was to market the benefits of ishares. It turned out to be the most successful new investment product launch in the past 15 years. www.ishares.com. 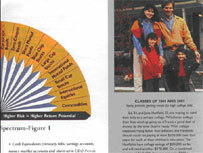 When Citicorp decided to use an asset allocation workbook to attract propects to their investment services and engage them in the investing process, they turned to me to write the workbook and supervise much of the design. One of the key things I did was to create stories as examples of asset allocation choices; stories of people and families at different stages of life. It was an engaging way to illustrate what they needed and what kind of asset allocation Citicorp might recommend to help them achieve their goals. 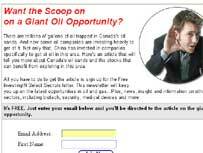 I created and tested a number of pay-per-click campaigns for this successful online gold investing newsletter. The winning campaigns demolished previous click-through-rates, driving more traffic to the sign-up page. 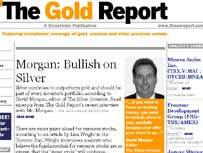 See The Gold Report. Being able to create high ROI pay-per-click ads synchronized with landing pages that convert well has become essential to online success. Here, I created a highly effective pay-per-click campaign tied to a powerful landing page for a real estate ebook I wrote.This campaign helped me sell over 1,000 ebooks (as well as created a targeted list) in a short stretch of time. To see one of the landing pages, click here. SEO is a big stew, with a range of ingredients: There's on-page optimization, including choosing the right keywords, smart use of meta tags, and effective internal link structure. Then there important off-page factors, such gathering relevant, one-way quality links. 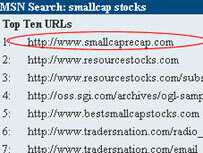 The trick, if you can call it a trick, is using and mixing on and off page elements together in just the right way..
Thats what I did here for the website www.Smallcaprecap.com. I blended it all together so that the site ranked number 1 on msn and reached the top 10 in google for the highly desirable keyword phrase - "smallcap stocks." Getting people to opt-in may be the most important step in creating customer relationships online. By creating a demand to read an article, I quadrupled the previous conversion rate, resulting in thousands of new opt-in leads for this investment newsletter. "Do yourself a favor, hire him today (unless of course, you're one of my competitors)." "Leon's very first copywriting assignment with us beat our long-standing control piece by 3X right out the gate. His understanding of our target audience, insights on what makes great copy, and ability to turn around the project on-time have me coming back for more. Do yourself a favor, hire him today (unless of course, you're one of my competitors)." "I've worked with Leon Altman for many years. He helped me build my successful financial magazines from the ground up. His direct marketing programs, sales letters and ideas were the foundation of their success. Now his online and offline expertise are vital to building my new businesses. If you run a business and want it to really grow, he's the person to go to." "...a terrific writer (and)...an exceptional conceptual thinker." "Not only is Leon a terrific writer but he is also an exceptional conceptual thinker. As a designer I always appreciate working with someone who knows how to integrate design, concepts and copy to make marketing communications more powerful." "If you want your next marketing project to succeed, call him." "I've worked with Leon for a long time. Not only is he one of the best copywriters in the business, but his concepts and strategies are always on the money. If you want your next marketing project to succeed, call him." "His ...writing ... and overall marketing savvy have been indispensable." "I've been in charge of marketing for a number of companies in my career. And I've called on Leon Altman to help market every one of them. His concepts, writing, originality and overall marketing savvy have been indispensable. Even if you have a whole marketing department at your disposable, I would still call on his services, because of what he adds to the business." "I love working with Leon. He comes up with tons of terrific ideas and concepts. And his sales copy brings in lots of highly qualified leads and more customers. "He has the sharpest creative marketing mind I know." "I've called on Leon Altman's creative services and marketing advice for over 12 years. He has the sharpest creative marketing mind I know. Let's talk about your writing and online marketing needs. to brochures and collateral. I can also help you get more out of the vast array of new online venues. Conversion is a process, not an event - and so is much of online marketing. I can make sure that each part of the process works with the other. without the right landing pages, you have little chance of converting a clicker into a lead. 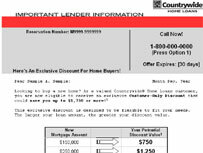 And to further increase conversion, you need to make an offer - a report, teleseminar, webinar, etc. - Email marketing, opt-in pages, autoresponder series, etc. P.S. Don't forget to sign up for a FREE Tips Report on the upper right column. Pay Per Click Success for Financial Advisors. able to access it for free.